Annie Oakley, the sharpshooter and star attraction at Buffalo Bill’s Wild West Show in the late 1800’s, is an Ohio native. She was born Phoebe Ann Moses on August 13, 1860 in Darke County Ohio, which is about 40 miles northwest of Dayton. Her father died when she was a young girl and she was sent to the county poor farm, where she received some schooling and sewing instruction. In her early teens, Annie ran away from a family she was sent to work for and reunited with her mother. To help support her family, Annie began hunting game for a general store. Her marksmanship was so good, that she was able to pay off her mother’s mortgage when Annie was just 15 years old. Annie and her husband joined Buffalo Bill’s Wild West Show in 1885, touring with the show for over 15 years. Audiences were dazzled by Annie’s shooting abilities as she shot off the end of a cigarette held in her husband’s lips, hit the thin edge of a playing card from 30 paces, or shot distant targets while looking into a mirror. She could also shoot holes through playing cards thrown into the air before they landed. In 1887, Annie became an international sensation when she performed at the American Exposition in London. There, Annie met Queen Victoria, who called her a “very clever little girl”, winning the adoration of British newspapers. Annie had become America’s first female superstar. Annie and her husband were in a train accident in 1901, and shortly thereafter she left Buffalo Bill’s Wild West Show to pursue other interests. In 1903, she was appearing on stage in a melodrama written for her, The Western Girl. She then joined another Wild West show, called the Young Buffalo Show, performing until 1913. Annie and her husband retired in 1913, living in Cambridge, Maryland. 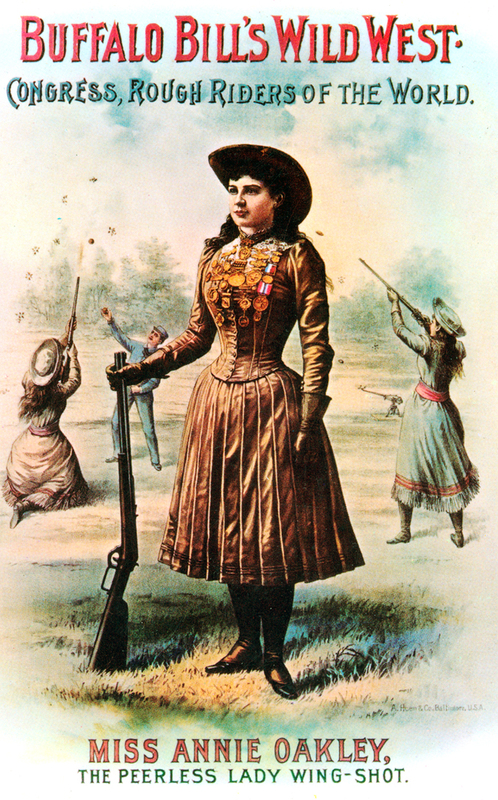 Annie passed the time by hunting, fishing, and teaching marksmanship to women. Annie was also an avid giver to charity, performing at events and giving donations to help orphans. During World War I, Oakley raised money for the Red Cross by giving shooting demonstrations at army camps around the country. Annie Oakley died on November 3, 1926 in Greenville, Ohio. Her husband of 50 years, Frank Butler, died 18 days later. 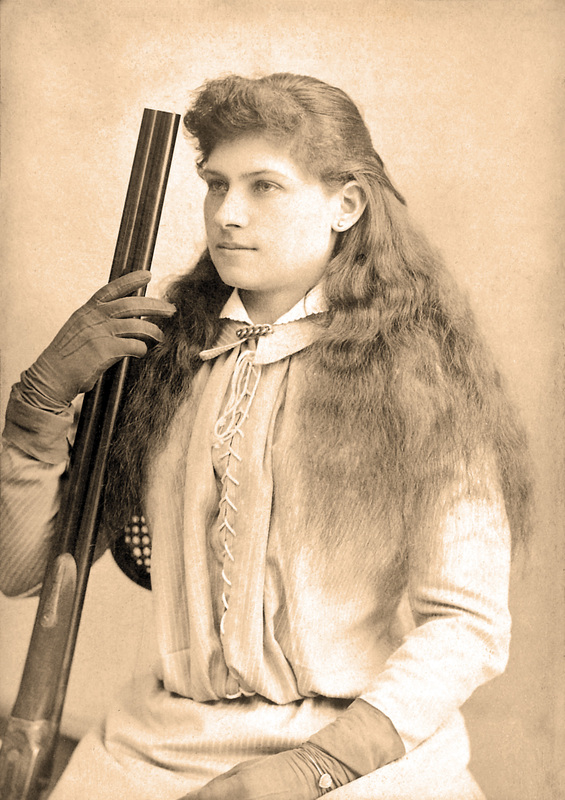 Escaping a poor childhood, Annie Oakley’s hard work and talented, catapulted her to become the first female star in a male dominated profession. Annie Oakley. (2014). The Biography.com website. Retrieved 09:03, Aug 21, 2014, from http://www.biography.com/people/annie-oakley-9426141.